A modern kitchen is not just a place where you cook your daily meals and wash dishes anymore. These days, it is also a statement of taste and fashion, which is why kitchen faucets have come to the forefront of kitchen appliances. Many decorators now call a faucet the heart of the kitchen. Why? Because the best kitchen faucets not only provide you with pleasing aesthetics but handle quite the use on a daily basis. To get the best value out of them, you not only need a reliable, effective faucet, but you’ll need one that looks good on the eye too. We have made a list of the best faucets on the market that you can buy right now, and how you can choose the best one for you! What is a Kitchen Faucet? How to Choose The Best Kitchen Sink Faucets? The Delta Faucet 9113T-AR-DST is an elegant-looking, well-polished, and simple to use a model that comes with all the top-notch features. With a twin-mode operating system – manual pull-down option, or the Touch2O feature for the best touchless kitchen faucet experience. There’s a water temperature indicator display powered by 6 batteries (AA), and covered by a 5-year limited warranty. If you love commercial design springs, then Kraus KPF-1602 might just be the one you’ve been looking for. With a solid brass build and anti-rust coating, this faucet is aesthetically pleasing and functionally superior from most other faucets in the same class. Its internal two-way flow control also complements its overall look and extraordinary performance. A kitchen faucet is one of the must-have appliances in a modern kitchen. You know the centerpiece of pretty much every kitchen sink that dispenses water? You might know them by different names like taps, sprayers, or just sinks, but the standard name for these is the kitchen faucet. The best kitchen faucets can come in a variety of sizes, which can be a high-neck or a low-clearing design, attached to the sink or the wall directly and so on. But the basic principle is simple – their main purpose is to dispense water for use in cleaning dishes, vegetables, and whatnot. Pretty much every kitchen has a faucet these days, but not all faucets are made equal. In the following sections, we will try to show you how these faucets can be wonderfully versatile – did you know that some of the best models are also the best bathroom faucet brands? We’ve also listed down some of the best brands and models currently available in the market. A) Single handle: This type of handles are usually attached to the faucet itself and controls hot and cold water by turning the handle clockwise or counter-clockwise. B) Twin-handle: This design by default delivers a classy, retro look that also comes in handy if you do like your hot and cold water delivered via different controls. A) High Arc: A high, gooseneck arch is more suited for kitchens where lots of bowls and vegetables are washed on a regular basis. B) Low Arc: If you don’t want your faucet to hog all of our kitchen views, then a low arc design might be for you. With a deep sink, low arc faucets can be space-saving and effective at the same time. A) Pull-down: These faucets are designed just as the name suggests – with a wand that needs to be pulled down for the sprayer to work. These faucets offer great flexibility and are the easiest to use when you have your hands full. B) Pull-out: These faucets come with a wand that you have to pull towards yourself. C) Side Sprayer: If you want extra reach for your sprayer, then a side sprayer is the best possible solution. It helps to save your main faucet from wear and tear, but also require one extra hole. A) Deck-mounted: The most common faucet style, a deck-mounted faucet is installed right onto your sink. Most modern faucets are designed in a deck-mounted fashion. B) Wall-mounted: Installed directly on the wall above your sink, these offer a more classical look. A) Single: The faucet requires only one hole to be installed, with the lever and/or hot-cold temperature controller wand sitting right on the stem. It is the most simplified yet effective faucet design. B) Double: The faucet comes with either a side sprayer, a separate temperature control lever, or even a soap dispenser attached on a second hole apart from the faucet itself on the first hole. C) Triple (and possibly more): These configurations are for faucets that come with separate temperature control levers for hot and cold, and sometimes a side spray along with those. These are for a more classical look, and usually not compatible with smaller kitchens. These models come with a single handle that you can pull out to adjust the flow of water. This comes particularly handy when one or both of your hands are busy and you’re trying to use the faucet. The spray head can usually be moved around too, meaning you can wash things in the sink, as well as on the countertop for specific needs. Pull down faucets are very similar to pull out ones, with the difference being you need to pull down the handle for the water to flow. Another major difference is that the spray head is fixed rather than being moveable. If you’ve got a big, deep sink, pull down faucets can be perfect for you with their fluid, constant water flow. A fusion faucet is more like a hybrid of a commercial faucet – the kind you’ll find in hotels and restaurants – and a regular one. They can come in a number of styles, and more often than not need a bigger kitchen space to be fully functional. For some people, a regular faucet with a fixed or movable head is just not enough for all cleaning purposes in the kitchen. And they are right, as a spray faucet can help clean dishes more easily than fixed spray heads. 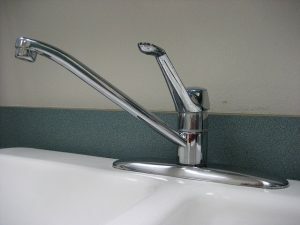 A fancier option, a two handle faucet can dispense both hot and cold water. The spray head has a handle on each side of it, and the head can be either movable or non-moveable. When talking about fancy, it would be a crime not to mention the best touchless kitchen faucet (s). If you really want to show off your beautiful faucet, then a touchless one can be the way to go. These stunning looking faucets discard the handle and work by detecting motion to dispense water. The best kitchen faucets are great in de-cluttering your kitchen and making it clean. Can you imagine cooking in a kitchen where there’s no separate cleaning space, the dirty dishes are everywhere, and there’s no drying place for the wet dishes? A faucet frees you from that and helps you keep your kitchen clean and organized. A faucet is as much a fashion statement in your kitchen as the designer countertop or the new China. It not only adds to the beauty of the kitchen but reflects your taste and personality too. These faucets are not only used for washing dishes and vegetables these days. If you get a model like a spray faucet, you can even water the plants and wash things like kitchen walls and floor with it. Some of the best models also come from the best bathroom faucet brands Neat, eh? Faucets have come a long way from their early design. Now with features like pull down and pull out, you can start the water even when your hands are busy. They are easy to shut down too, making them extremely convenient to use. There are literally hundreds of models and designs in the market when it comes to these faucets. You can choose a faucet for you from a very wide range of choices that fits your requirement, taste, and overall decor of the kitchen. Since different faucets from different manufacturers come with different installation directions, it is best to refer to the product manual before installing one. However, in this section, we will take you through the basic installation process for most of the best kitchen faucets, bar a few high-end or unusual designs. Find out the water valves under the sink, and turn them off. Let your faucet empty the residue water by turning it on. Before disconnecting your supply line, put a bucket under the connection to catch any leakage. Use your basin wrench to remove the nuts from under the sink to take off your faucet. Remove your faucet and clean any mineral or residue from where the faucet used to be. Place your gasket/ trim ring/ rubber over the faucet hole (s) and put down the deck plate. Use putty or caulk if necessary. Put the faucet lines as per the holes. Under the sink, put on the nuts and washers, as well as putty or caulk as necessary. This step is for pull-down faucets only. Connect the fast-connect hose to the supply line. For this, pull the hose down and attach the accompanying weight. If yours is not a pull-down faucet, skip this step. Connect the supply lines to the faucet. You might need plumber’s tape at this point for a secure connection. Turn on the water slightly to see if there’s any loose connection or leak. Tighten, or use plumber’s tape and/or putty if there’s any. Remove the faucet aerator and let the water run for some time to clear supply lines. Again check for any possible leaks and fix accordingly. Put the aerator back in and turn off the water. Your faucet is now good to go. 1) There are so many faucet designs and models in the market. I am confused about which to choose. Any suggestions? Keep two things in mind when you’re looking for a faucet – your requirements, and the size and décor of your kitchen. For example, you might be looking for a water supply solution that can be used for both cleaning dishes and watering plants. In that case, a faucet with an additional spray nozzle should be your pick. Similarly, your kitchen might be small, in which case buying a commercial-grade faucet would not only look odd, but it will hog plenty of space too. 2) Do I need all the high-tech features in a faucet or just a plain old faucet will do? To be honest, there’s no right answer to this question. Some people like to have a good old pot filler faucet in the kitchen with no additional features, whereas some people love all the extra features a high-tech faucet will come with. Truth be told, we prefer the latter, simply because of the fact that it feels so much better to have hot or cold water at your command, and that too without touch. Right? 3) What should I know before buying a faucet? Any there any technical aspects I need to focus on? Faucets come with a lot of technical details, most of which might be hard to understand for the common people. For this reason, it is always better to consult a plumber before making the final purchase. However, on a more surface level, pay attention to the installation process, whether or not it is compatible with your current setup, is there any warranty or not, what kind of power supply your faucet might be needed, is there any need for lubrication or not, and so on. More on this have been discussed in the previous section. 4) Do brands matter when buying a faucet? Or can I buy pretty much any faucet? Well, brands definitely matter. Buying a faucet from a popular manufacturer means getting at least a level of trust and reliability with it, as well as connecting with thousands of other buyers who bought the same product. Repair and returns are more trustworthy too, and most importantly, brand names like Kohler and American Standard usually make products that are ADA compliant and are more or less versatile when it comes to installation. 5) How many holes do I need to my setup to install my faucet? Kitchen decks can have anywhere from one to four holes, with hot-cold water combinations needing at least 3 to 4 holes to work. Most faucets are versatile enough to be installed with any number of holes, but some are not. Make sure to check your current system for the number of holes, and buy your faucet accordingly, so that your new faucet is compatible. Touch2O: This is the patented touch technology that sets off and stops water flow. Diamond Valve: These valves ensure the faucets do not leak and make them last longer. Magnet Docking: The magnetic docking feature ensures that the spray head remains in place throughout use. Reflex: Make swiveling the spray head easier, as well as retracting and docking more secure. Spot Resist: The aforementioned resistant technology against spots of all kind, as well as a fingerprint. Ceramic Disc Valves: Ceramic valves in all Kohler faucets mean long-lasting, durable performance. Temperature Memory: This technology helps the faucet remember the last temperature it was set in, thus lessening your work. Swiveling Spout: Kohler faucets have a 360-degree swivel and rotate design, making them very easy to maneuver according to your needs. American Standard has been in the business for more than 140 years, and like any of the long-running companies, it has been churning out good products on a regular basis to win over customers. 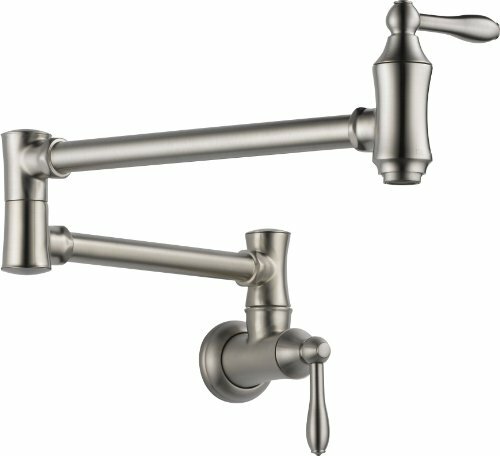 A sister brand to Grohe, American Standard specializes in affordable yet stylish faucets. Covering both high and mid-range faucets, they are reputed for tough builds, scratch and corrosion-free materials, and overall reliable performance. If you’re looking for a top-of-the-shelf, cutting-edge faucet that comes with a lot of useful features, then the Delta Faucet 9113T-AR-DST Essa Single Handle Pull-Down Kitchen Faucet can be your pick. It looks elegant, well-polished, and yet simple to use and install. The contemporary design of this faucet is complemented by a twin-mode operating system – you can use the manual pull-down option, or you can use the patented Touch2O feature for the best touchless kitchen faucet experience. There’s a water temperature indicator display too, dubbed TempSense by Delta. All these are powered by 6 batteries (AA), as well as an optional AC adapter. Installing this faucet is a breeze too, by the way. With its patented Duramount system for installation, it prevents leaks by using a single-line supply pipe and a seal valve. Available in four colors – Venetian Bronze, Matte Black, Arctic Stainless, and Chrome, this faucet will give you peace of mind too with Delta’s 5-Year Warranty. If you love faucets from Delta but looking for something more traditional and low-tech, then you can choose the Delta 1177LF-SS Pot Filler Faucet without worry. With a good looking double-jointed design, it comes with the simple on-off handle. This faucet comes with four different settings. Whether you’re looking to fill your pots or just to clean things, the Delta 1177LF-SS will serve with dependability. Add to that the lifetime warranty and ADA compliant installation, and it is a deal too good to turn down. Faucets are great additions to a kitchen because they are not only useful but easy on the eye too. Modern faucet designs add to the overall beauty of the kitchen, and the Yodel Swivel Head Modern Kitchen / Wet Bar Sink Faucet is no different. This sleek, artistic faucet is made out of solid brass, which ensures a heavy, yet polished look. But it’s not all looks either, as the faucet features a no-drip spray and easy control. It is super easy to install, and even easier to clean and maintain. By now, you might be wondering why we keep putting Delta Faucet on this list. This is because they make some of the top-shelf faucets in the market, and the Delta Faucet 9178-AR-DST Leland Single Handle Pull-Down Kitchen Faucet is a testament to that. 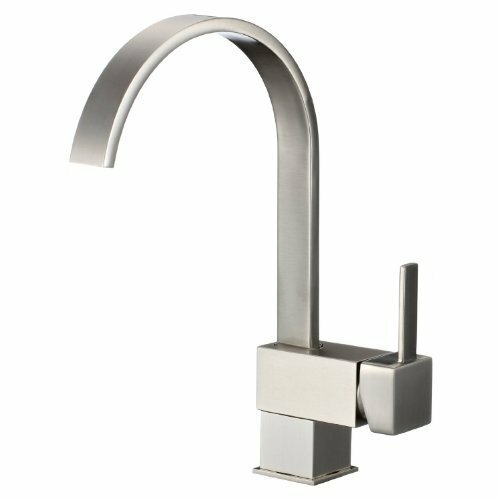 This faucet is made in a contemporary yet elegant design that is easy on the eye, and will definitely add to your kitchen decor. On the functional side, it comes with a magnet-docking system that secures your spray wand, while its diamond seal ensures that there’s no leakage. 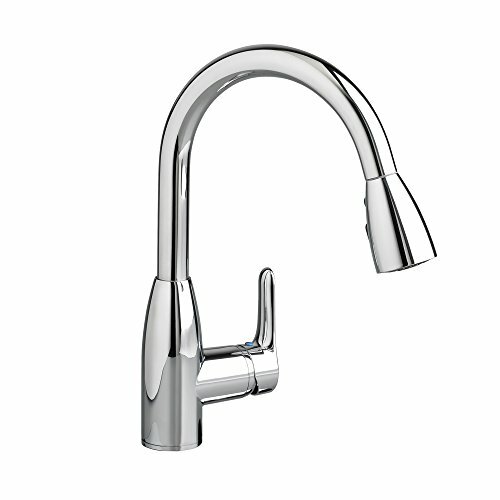 Also, the Delta Faucet 9178-AR-DST is easy to install. You get the supply lines free with your purchase, and the product is available in four different designs to match your personal taste. 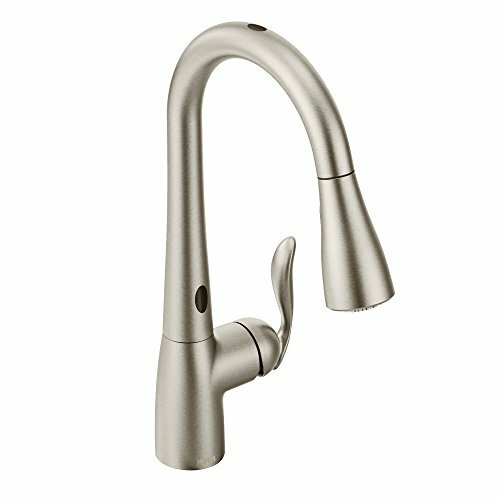 The Moen Arbor Motionsense Touchless One-Handle High Arc Pulldown Kitchen Faucet is a great looking pulldown faucet that works great too. With a spout height of 15.5 inches, the head can move freely and cover a large area for washing. But you don’t have to worry about its endurance, as Moen’s patented Reflex technology makes sure the movements are fluid while keeping the spray head securely docked. Unlike many other faucets in the market, this one is resistant to water spots and fingerprints. With an easy installation process and hands-free water release, this can be a great pick for you. When it comes to kitchen appliances, Kohler is one of the few brands to spring straight to mind. 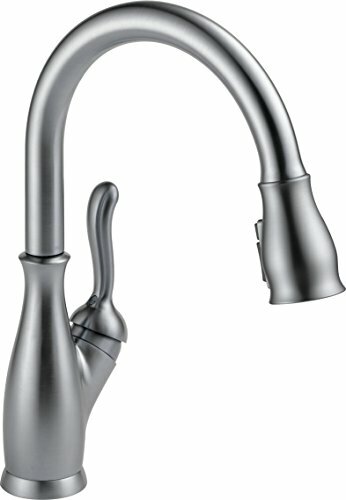 Its K-560-VS Bellera Pull-Down Kitchen Faucet is top notch faucet with a lot of useful features. These include three-step touch controls for switching between sweep, stream, and pause, a magnetic docking system, and a 360-degree rotation feature for the spout. To top it off, you get a versatile installation system that is conveniently compatible with one to four-hole systems. Kohler’s patented MasterClean feature also makes sure that the mineral buildups over time are very easy to clean. All this, packed into a simple and sleek looking design is reason enough to consider the Kohler K-560-VS Bellera Pull-Down Kitchen Faucet. 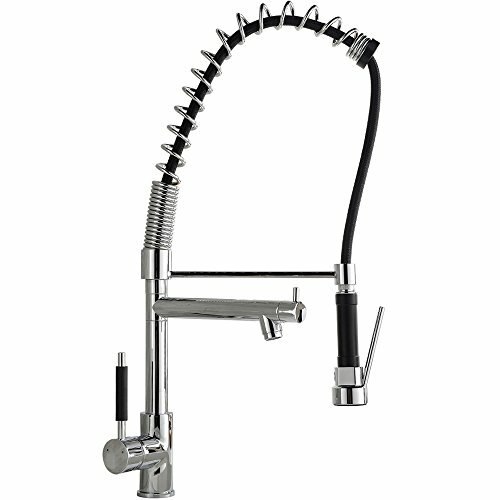 Everyone’s got their different taste and style choices, and if you are into commercial design springs for faucets, then the Kraus KPF-1602 Single Handle Pull-Down Kitchen Faucet can be a godsend for you. With a solid brass build and anti-rust coating, this single handle faucet is both convenient and aesthetically pleasing. With an internal two-way flow control, you will get bang for your buck from this faucet. American Standard needs a little introduction when it comes to kitchen appliances and accessories. 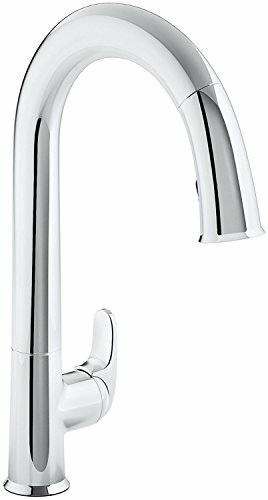 Like all other American Standard products, its 4175.300.002 Colony Soft Pull-Down Kitchen Faucet is a great faucet that holds up the company’s reputation. With a brass spout and pull-down spray that can cover quite a large area, this faucet is perfect for almost every kitchen. The metal handles are easy to use, while the surface itself is corrosion, scratch, and tarnish resistant. 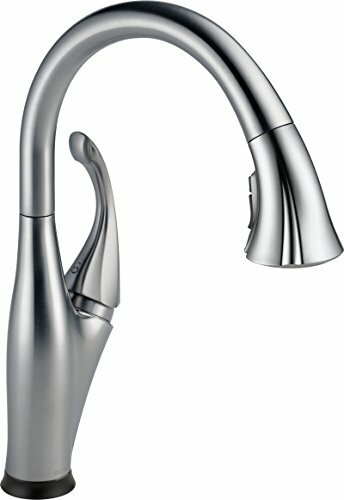 If you want a faucet that is both elegant in looks and comes from a reputed brand, then this is the one from you. The Comllen Kitchen Sink Faucet is a great blend of design aesthetics and utility. This commercial design pull-out faucet supports 360 rotation, smooth spray and stream flow, and free from annoying drips. 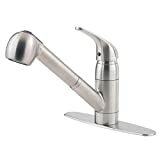 The single handle control helps use this faucet one-handed with ease, whereas the overall build comes with a sleek chrome finish that is both corrosion and tarnish-resistant. The installation is easy too, compatible with single hole ones. 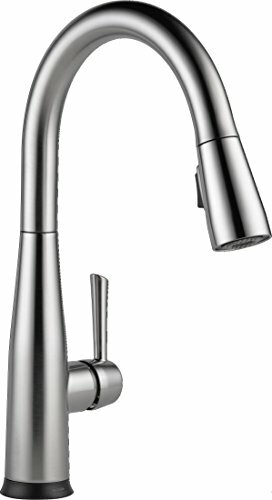 The KOHLER K-72218-CP Sensate Touchless Kitchen Faucet is one of the best faucets that packs pretty much all the features you would expect from a premium, top of the line faucet. It looks incredibly sleek, has cutting-edge features, and delivers value for your every penny. This faucet from Kohler features a state-of-the-art touchless sensor that takes less than 20 milliseconds to respond. Couple that with a false activation-proof precision activation system, and you get a faucet that works reliably every time. Kohler has put in a number of impressive features in this faucet, which include the likes of magnet docks, exclusion of batteries and AC-powered technology, twin function – sweep and spray, and a specially positioned nozzle for maximum effect. What more can you can from your faucet? 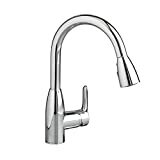 Another Delta product on this list, the Delta Faucet 9192T is a neat little product that can be a great pick if you’re willing to shell out a few extra bucks from your pocket. It comes with a touch-to-activate function, as well as a manual handle for your ease of use. Temperature and flow controls are conveniently placed above the sink, while you get to see the water temperature in an LED display right on the faucet. The whole setup is powered by 6-AA batteries, but you can also choose to have AC power instead. Oh, and did you know that you get 5 years of limited warranty with this faucet? 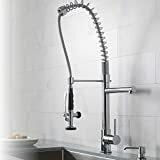 The second Moen faucet we’re reviewing on this list, the Moen 7594ESRS is a reliable modern faucet that ticks all the boxes. It features the best touchless kitchen faucet operation experience, an exceptional build that is resistant to water spots and fingerprints, and most importantly, quite easy to install. You get a magnetic docking system that secures the spray head, while the control system for the flow of water is very easy to use. All-in-all, this can be a great addition to your kitchen in terms of both function and aesthetics. The first words that come to mind after seeing the Pfister Pfirst Series 1-Handle Pull-Out Kitchen Faucet are elegant and bold. There’s no denying it – this faucet does have an in-your-face feeling, but it delivers double time to go with that bold look. With a lead-free build and a high arc design, this faucet is perfect for your kitchen regardless of its size. The modern, bold look goes with pretty much any decor, which is complemented by the twin-function stream and spray modes, as well as a very easy installation process. 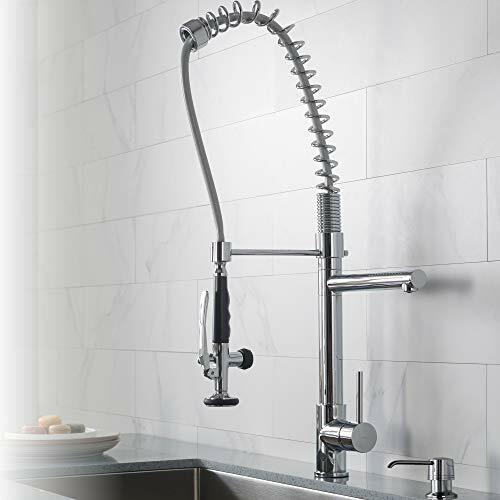 The Delta Faucet 9113T-AR-DST is an elegant-looking, well-polished, and simple to use the faucet that is too good to not invest in. Its top-notch features include a twin-mode operating system – manual pull-down option or the Touch2O feature for a touchless experience. You’ll also get a water temperature indicator display and a 5-year limited warranty coverage. For best kitchen sink faucets in a commercial design, the Kraus KPF-1602 really hits it out of the park. With a solid brass build and anti-rust coating, it is aesthetically pleasing and functionally superior. Its internal two-way flow control further complements the overall look and performance. Kitchen faucets have become an everyday staple of the modern kitchen. Apart from their reliable performance, the best kitchen faucets deliver on the aesthetic aspect too. If you’re upgrading from your current faucets, or simply looking to buy a new one, any of our picks for the best ones is a good place to start. We know your faucet is not just a water dispenser, but an integral part of the entire kitchen décor.